Marco Milanese, from Friuli, born in 1987, studied at the Liceo Scientifico and at the same time carried out professional experience as a rugby player. He started Forestry Sciences, then the mountain “called” him : he then became an Alpine Mountain Guide since 2011, slackliner from 2013, base jumper, wing pilot and speedflyer since 2014. Marco is getting noticed, since a couple of years, for his very interesting adventures that have had a good echo on social media: he’s not like a compulsive video poster, but in its adventures it is always present a character of experimentation or exploration in the broadest sense, such as the base jump from the Bell Tower of Val Montanaia, the speedflying of a volcano, a trip to Turkey with many base and wingsuit jumps and highlines ; his most recent feat, realized in late August was the freesolo climb of the Tre Cime di Lavaredo in Dolomites, with descent through base and wingsuit base jump from all three peaks. The following is an interview that has kindly released us – and hopefully will make you understand more deeply the path, the motivations, the emotions that Marco Milanese puts into play in his intense life between Earth and Heaven, looking for a Equilibrium. Marco : Your progression, your path in balance between climbing and jumping, is something really impressive. By reading your resumé, I have the idea of ​​a kind of monk, because the extensive and fast training in the individual disciplines you have faced, considering the complexity and hardness in managing each one of them. Is that it? Do you have a common methodical approach on all your projects? And if so, what are your greatest difficulties, the limits that you recognize ? I have a curiosity about your path between disciples : I know that generally at least a 200 jumps from the plane are considered indispensable before the transit to the base jump. More to wear a wingsuit, both in the air then to Alpine Base. But there are exceptions. Can you tell us something about it? What or who inspired you on this road of jumping, which strongly intersect with mountaineering ? I have always had a strong attraction towards emptiness, it relaxes me, makes me think more clearly. I researched it at the beginning with the climbing.. because it was the most obvious thing, then with the highline and finally, thanks to a left wrist injury that did not allow me to climb, but to open a parachute, I threw myself in this adventure . 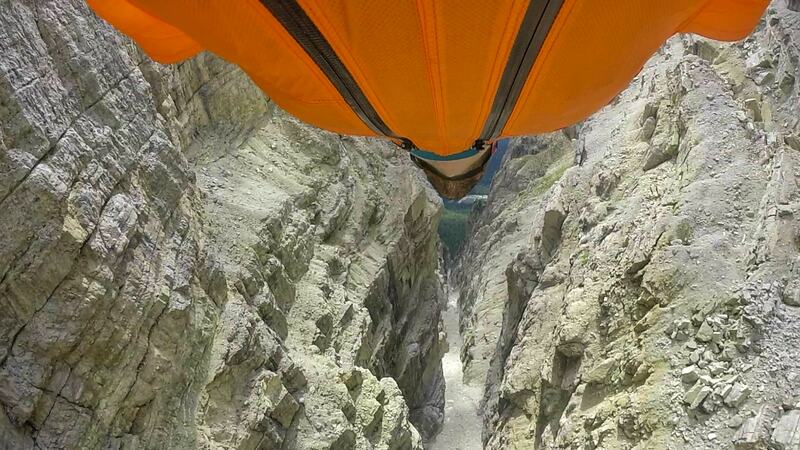 The “normal” route to jump from the mountains with a wingsuit is long. You need 200 jumps from the plane before you can wear a small beginner jumpsuit, as you need 200 to do a base jumping course. Then the two things come together, the basejumping and the wingsuit. I say that I have speeded up a few steps – but I want to assure you that I have never skipped any step! The unaware people in this base world… they are another thing, is just a new type of a suicide (because it is not possible to assimilate it to the world of BASE) ..there was one guy that had 5 jumps from the plane and no experience of mountain ,nor wing suit who decided to try, easy no? He will have seen it many times in the videos. I let you imagine the bitter end. Combining mountaineering and BASE has become something natural for me, but in a right way. As for your professional job as Alpine Guide, I imagine it is your solid point for your financial support – and main source to have budget for other activities. Is it like that or are you also having satisfactions with some sponsors for the missions, you’ve made? Yes, let’s say that at the moment the only economic support is the alpine guidejob, sometimes also I do some Highline shows with my girlfriend- she’s dancing on the aerial fabrics but nothing more, apart from Monvic who generously provides me with the clothes to climb and PhoenixFly who supplies me with wing suits at very low prices. As for now, nobody sponsored me and I did not look for them. If you have someone for shoes and clothes in goratex let me know, I do not need much more. Recently you have made a trip to Turkey, on Facebook you have posted very beautiful images showing a country in great growth, talking about the presence of beautiful mountains and sites suitable for flights, base , climbing, highlining. Can you summarize brifly your experiences and numbers, how long were the approach, how many jumps, how many days? To get an idea of ​​how intense was that whole experience. This experience was a real exploration trip in the mountains of the far north-east of Turkey. Thanks to a local jumper. the government of the region has supported us with all possible means, pickups, bulldozers to clean the streets, ambulances to landings, boats for water rescue. The first week we were in Uzundere where we practically went around, we looked at a mountain we found a way to climb it (generally very easy because they built dirt roads everywhere to build electricity pylons) and jumped with or without wingsuit. I personally opened two new exits on the day of my birthday. Then we jumped ruined castles, antennas and lower walls. Everything we saw as safe we jumped it, what an experience! The second week we were in the park of Kamalye, already known for the climb (little), bike, and the base, here people knew English and were not as conservative as in the first village we visited. 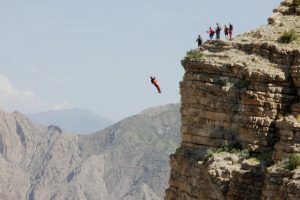 15 busted jumpers were welcomed with open arms with the greetings of the authorities and the beginning of the jumps with the wingsuit over the village. Later we jumped from a stretched cable above the euphrates with a small chairlift created for the occasion. They sent us downtown with this seat and then jumped! wooooow. 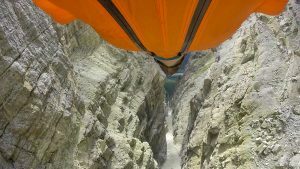 The debate about the extreme danger of the wingsuit used in BASE, even more in Alpine contexts, is quite lively, you have personally experienced in an article on the motivations of some time ago, with comments on social media showing a brutal cynicism for those who practice a discipline so extreme (and I add, often dictated by ignorance in the narrowest sense of the word). I ask you brutally: do you look for increasingly difficult proximity lines, more complex exits, launch after launch? Or do you impose a kind of control over your limits? How do you prepare a launch from a new exit, alone or with the companions change things? It is a new sport that has yet to know its limits, people speak because they do not know well what they are talking about, as always. How often we “alpinists” or “climbers” have heard that we are unconscious. The truth is that there is a world behind that few know, and often is misrepresented by criminal journalists or suicide madmen who want to throw at all costs because it is cool. But nobody talks about 60-year-olds who have made the history of this sport with an impressive amount of jumps (we are talking about 3-4000 jumps only of basejump). However returning to us, in general I always look for a good reason to jump, this can be a difficult exit or a line of aesthetic proximity but can also be jumps with friends and follow each other, or do somersaults just for the sake of seeing the your friend make them next to you. Lately I try instead to find a beautiful mountain to climb and jump, no need to have a difficult jump. A new exit…I prepare it very carefully, we have a lot of data available on our flights thanks to special gps and flight schedules and with lasers to measure the new exits and know if they are feasible, I study and review the data until I am sure that be feasible with an adequate safety margin, look good atmospheric conditions and good thermals and then go! 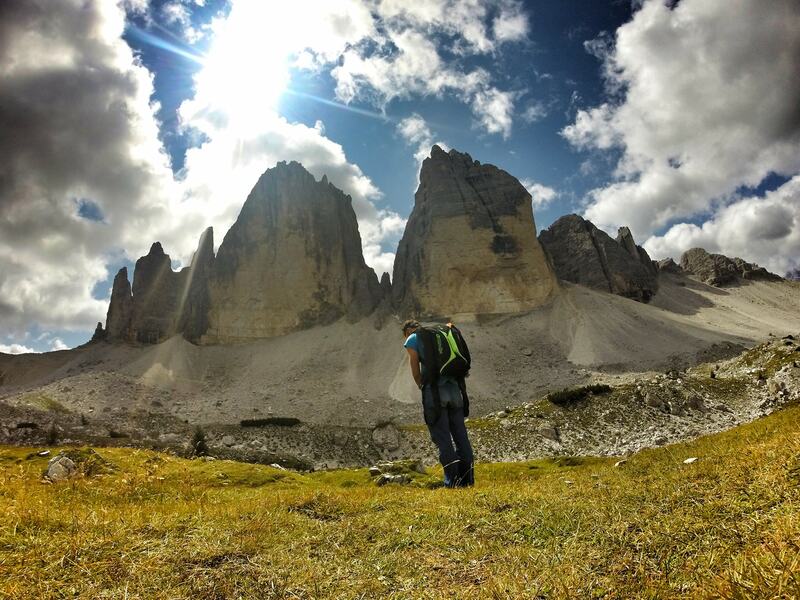 How did you prepare the triptych on the Cime di Lavaredo? 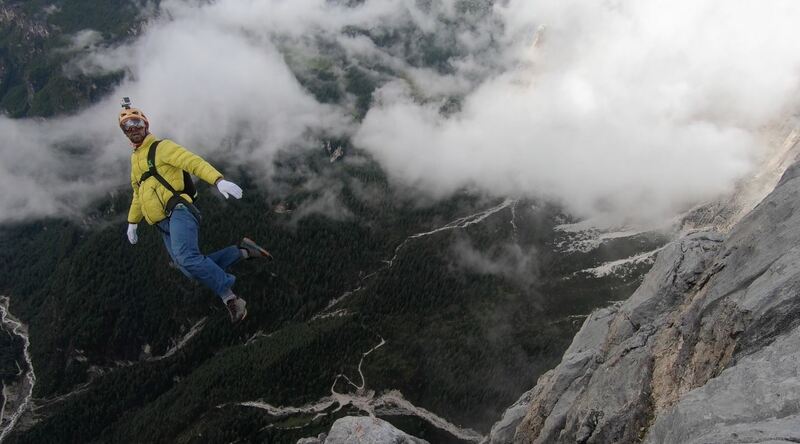 I read on planetmountain that you heard Thomas Huber, who in 2008 drew a first idea of ​​concatenation with a base jump..da what did you have in mind this project? This project was born a few years ago when for the first time I jumped the big top. The chaining was a natural idea that jumped into my mind. I just had to wait for the right time, when I had already a bit of training with this style behind me. Last year for example I climbed the socondo edge in Tofana and at the top I jumped with the suit, in total from machine to car I took 2 hours and 15 minutes if I’m not mistaken, I realized that I could also try on the three peaks . I spoke with Huber asking him about the jump from the west of Lavaredo but then I decided to change the program and it’s over that I opened a new exit on the west. The logistics of this nice trip was not easy because having only two parachutes I had to fold one, also one of the main problems was that I had to find the point from where to jump on the small and west. Arrived at the start of the path to the small top of Lavaredo I left a parachute and I climbed with the other, I climbed the normal which is a way of IV, I dropped and found the exit I jumped. I folded the parachute near the church and I headed on the two north, left a parachute at the base of the edge Dibona I headed to the edge Demuth, climbed this halfway I found a perfect exit and I jumped, you can not jump from no part higher than the yellow cliffs because then the wall is supported. Finally I went back to the Dibona corner and with the suit and the other parachute I climbed the corner, among other things, as a bad cloud was coming I ran like crazy going up in less than an hour. At the top I wore the suit and off to the last jump with landing on soft grass. Thanking you for your time, the final question is: where are you going? I do not care much about knowing the next project, but understanding from you if you have identified a path or some medium /long term goal. The ultimate goal is always as they say in English “having a good time” but certainly the climb and fly will have a central place, I think it is the purest form to climb a mountain. Attached with a parachute in the back, without using stopping nails and ropes, fast both in the ascent and in the descent. You do not need to leave traces on the mountain, as if to say “I have passed by here” by planting a nail. It leaves everything intact. Pure.